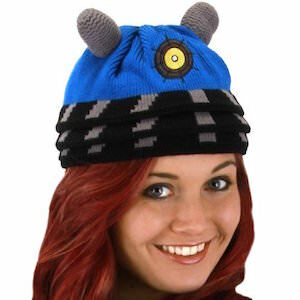 If you like Daleks and Doctor Who then this beanie hat could be just what you need. This blue beanie hat looks like a Dalek with antenna on the top in grey and the shape and color combinations make it look like the real top of the famous enemy of the Doctor. This Dalek winter hat is one size fits most and both men and women can enjoy wearing this hat outside in the cold or as part of the Dalek costume for Halloween. And even if you think Dalek are bad then you can still wear this hat as it shows the world that you are a true fan of Doctor Who. 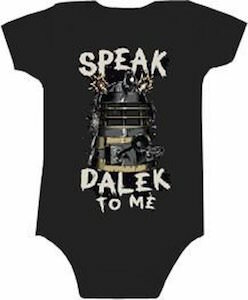 If you are having a baby and you are a big Doctor Who fan then this baby bodysuit is just what you need. The snapsuit has shows sleeves and is black and on the front it shows an image of a Dalek and around it you find the text “Speak Dalek To Me”. Maybe your child’s first word can be Dalek or Exterminate witch would be different and unique and definitely something you keep talking about the rest of you life. You can get this baby clothing in sizes ranging 6 – 24 months and all are made from 100% cotton. 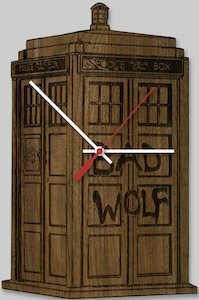 Now a wall in your home can have a Doctor Who wall clock made from wood. This wooden clock comes in walnut or cherry wood giving you the options between a lighter or darker color. Each clock is die cut in the shape of the Tardis and on the wood they engraved the details of the Tardis and they do include the “Bad Wolf” words on it. The Tardis wall clock is 13.5 x 9 inch and it something truly unique and hard to find. The Tardis from the Doctor may travel in time and space but this Doctor Who clock will tell you the right time for you any time. 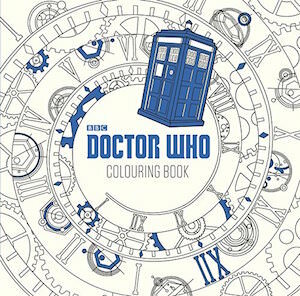 Adult coloring books are everywhere and now there is one for Doctor Who fans. This Doctor Who coloring book makes you color things like the Tardis, Weeping Angels, Dalek and even Missy. Of course there is much more that can surprise you while you are flipping through this book to find the page your want to bring color to. Inside this book your will find 45 stunning images to color and yes it maybe a bit more difficult then a children’s coloring book but that is to expected and it will keep your busy for many hours. If you like Doctor Who and soup and sandwiches then now you are going to love it even more as there now is this amazing Doctor Who set specially made for your soup and sandwich. 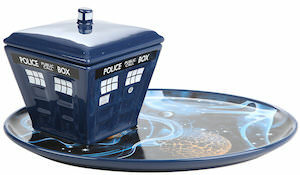 This set has a plate that shows a vortex and galaxy and then on top of that you find a soup bowl with a lid that looks like the Tardis from the Doctor. This set is made from ceramic and is dishwasher and microwave safe and just the perfect way to get your food served. Now soup and sandwiches would be your go to food just so that you can eat it from this plate and bowl set. Do you use a sugar and cream set for your coffee or tea? 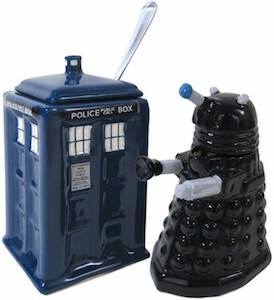 A true Doctor Who fan may think about doing so now there is this amazing sugar and cream set. The set has a Dalek and the Tardis. In the blue Tardis there is where the sugar goes because the Doctor is sweet. and then in the black Dalek that is where the milk or cream goes. So now tea time will be so much better with this Doctor Who set for cream and sugar. Why go use a boring pot of sugar and use cream out of the carton when you can have a nice Doctor Who set like this. Now we can decorate the bathroom into something special. And the shower will be bigger on the inside because now you can have a Tardis shower curtain. 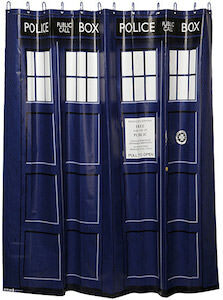 The Doctor Who shower curtain is the normal 72 inch square and comes with 12 blue hooks to hang it. Just imagine your bathroom to look like a scene of Doctor Who with a shower curtain that shows the famous Tardis complete messages on the door like we see on the Tardis of the 11th Doctor. This Doctor Who Tardis shower curtain is made from 100% eco-friendly EVA vinyl and PVC-free and is also officially licensed.